THE ABUNDANCE OF PROPRIETARY PROTOCOLS AND INTERFACES THAT RESTRICT OR PROHIBIT HEALTHCARE DATA EXCHANGE TAKE A HUGE TOLL ON PRODUCTIVITY. HEALTH SYSTEMS AND PROVIDERS SHOULD DEMAND BETTER INTEROPERABILITY. Does the technology within our health system help clinicians excel in their jobs and achieve the best possible outcomes for patients? Does technology function seamlessly in the background, allowing streamlined operations and freeing care teams to return to the patient bedside? Have we optimized the return on our technology investments? Unfortunately, the vast majority of medical devices, electronic health records (EHRs), and other IT systems lack interoperability—i.e., the ability to seamlessly share and use information across multiple technologies. Perhaps more precisely, they lack a common, built-in system that can exchange information across vendors, settings, and device types. Various systems and equipment typically are purchased from different manufacturers, and each comes with its own proprietary interface technology. As a result, hospitals must spend time and money—both scarce resources—setting up each technology in a different way, instead of being able to rely on a consistent means of connectivity. Moreover, hospitals often must invest in separate “middleware” systems to pull together all these disparate pieces of technology to feed data from bedside devices to EHRs, data warehouses, and other applications that aid in clinical decision making, research, and analytics. Many bedside devices, especially older ones, don’t even connect; they require manual reading and data entry. The nation’s largest health systems employ thousands of people dedicated to dealing with what one system dubs “non-interoperability.” The exhibit below depicts the current state of data flow. The current lack of interoperability can compromise patient safety, undermine care quality and outcomes, contribute to clinician fatigue, and waste billions of dollars annually. It also hinders progress toward achieving goals for population health management and precision medicine. Worse yet, it impedes innovation, which may be the biggest missed opportunity for health care. People with ideas for doing things differently—both in terms of care processes and technologies used—face significant obstacles accessing data, validating solutions, integrating into highly configured environments, and scaling implementations across varied settings. As a result, innovators often steer clear of the healthcare market because navigating it is simply too difficult, which has the perverse effect of reinforcing entrenched, proprietary interests. By contrast, the seamless exchange of information would improve care, increase operational efficiency, and lower costs. It would facilitate care coordination, enable informatics, reduce clinician workload, and increase the return on existing technologies. To realize these benefits, healthcare organizations must rethink how the disparate pieces are connected not only within one hospital, but also among every entity involved in a patient’s care, including physicians’ offices, home health agencies, and other post-acute care facilities. Rather than continuing to be constrained by the high-cost, proprietary status quo, health systems and providers should demand and adopt a platform that is standards-based, addresses one-to-many communication, allows two-way data exchange in real time, and enables plug-and-play integration of devices and systems. Let’s explore these attributes. The use of standards-based interfaces will reduce costs by decreasing the number of interfaces that must be built and maintained. In January 2016, the Senate Health, Education, Labor, and Pensions (HELP) Committee released draft legislation calling for such standards.aSeveral private-sector entities, including standards development organizations, continue to develop new protocols, and improve upon existing ones, for data exchange. Those responsible for purchasing and implementing technology should reward vendors that adhere to standard, as opposed to proprietary, approaches. Policymakers and regulators can provide the push toward standards-based solutions while the market creates the pull. One-to-many communication refers to the need for one device or system to communicate with multiple other devices and systems, sometimes at the same time. For example, data elements that are critically important to the safety of care and patient outcomes, such as patient allergies, are manually entered and reentered even on the same inpatient or outpatient visit. Ideally, the data would be entered once and automatically shared with various systems, making it available to any care team and avoiding potential mistakes from delayed data entry. This capability, combined with real-time, two-way communication, would improve workflow by automating tasks as appropriate and ensuring that needed information is readily available—all with appropriate levels of privacy and security. Two-way data exchange is the backbone of a learning health system, characterized by the Institute of Medicine as a health system “designed to generate and apply the best evidence for the collaborative healthcare choices of each patient and provider; to drive the process of discovery as a natural outgrowth of patient care; and to ensure innovation, quality, safety, and value in health care.”b Patient care technologies need to be able to send and receive data in a manner that enables feedback loops and automation. When connections are one-way, information doesn’t always reach the destination where it is needed and often places the onus on individuals to detect problems. In some cars, for example, sensors are able to communicate with brakes and automatically intervene to prevent crashes. The lack of such information exchange in health care frustrates efforts to apply advanced informatics and improve clinical workflow and care delivery through automation. Plug-and-play means that when two independent pieces are connected, they self-configure and can talk to each other without (or with minimal) human intervention. For example, an ATM card can be used in any ATM around the globe. A platform with these attributes would give a health system or provider greater control over the data it needs to deliver safe, efficient, and effective care. A hypothetical platform is shown in the exhibit below. A key feature of the platform is that it makes it possible to scale interoperability. It provides a blueprint for how the various technologies used in patient care can plug into a health system’s operations. The platform uses adaptors and standards-based interfaces to connect data producers with data consumers. If a vendor can certify that its product works with the platform, the product will be interoperable with any other system already connected to the platform. This interoperability is analogous to how the electrical system in your home works—you can plug a phone charger into any socket in any room and it will work. The blueprint is the foundation for standardization and innovation. Vendors can compete on capabilities and features, not on access to data, and provide more useful products because they can use all data that work with the platform. The use of standards-based interfaces also levels the playing field and reduces barriers to entry for those trying to innovate in health care. Creating and implementing a standards-based system is no small task, and impossible for any single system. The procurement process is an effective lever for this magnitude of change. Health systems and providers—as the organizations buying, implementing, and using technologies to care for patients—can and must transform the technical underpinnings of the healthcare industry. Purchasers can reward vendors and developers that work together to adhere to the blueprint, thereby instilling confidence that solutions will work as expected, safely, and securely. The unified voice of health systems and providers making consistent requests of vendors would benefit purchasers and sellers alike. The need to create and support customized solutions often is a financial burden on vendors as well. A centralized approach to establishing requirements can overcome the inability of a single health system or provider to compel change on its own. Requirements should be specified in requests for proposals (RFPs) and upheld in contracting language. For the vendor community, a centralized approach also provides a focal point for engaging customers in solving shared technical challenges. It also makes enlisting the help of other industries easier. Breaking legacy thinking is one of the hardest, yet most critical, aspects to revamping data flow in health care. Learning from those industries that have conquered similar challenges is invaluable. Concurrent proprietary advances are common in the natural evolution of technology. Only after users have adopted disparate solutions do markets tend toward consensus and standardize on important operational parameters. The difficulty with regard to healthcare technology is that advances have been so rapid, and solutions have been so complex, that the “natural” evolution toward standardization is a decidedly uphill battle. If progress is to be made any time soon, it will require significant pull from users, to use marketing terminology, rather than waiting for a push from suppliers. The following seven steps provide a methodical approach healthcare providers can take to encourage technology suppliers toward standardized information sharing. Assemble a team. An effort as expansive and complex as improving the interoperability of a health system requires a champion (or team of champions). Start by assembling a team of cross-functional individuals, including caregivers, clinical informaticists, IT professionals, clinical engineers, operations leaders, financial managers, and a patient advocate. This team should have CEO sponsorship to ensure organizational alignment and assistance in overcoming barriers. Describe the desired state. A major objective of the team is to set a vision for the future. This vision should reflect organizational priorities and not be limited by the constraints of how things work today. The people, process, and technology framework can be a helpful organizing principle. The vision should contemplate improving patient outcomes and treatment experiences. It might, for example, imagine a quieter care environment that leverages built-in technology for identifying and monitoring patients. The vision could set a goal for HCAHPS scores and address the necessary inputs. The vision should account for care teams’ biggest pain points and reimagine workflow to create a better user experience with seamless technology that supports care. One large health system armed 800 of its frontline nurses with 3-by-5 index cards and asked them over the course of two days to write down what they needed to improve their care delivery. The top needs identified through this exercise were cleaning up the EHR terminology; making the nurses mobile without nuisance alarms and notifications; and, most important, getting the nurses back to the bedside with the support of seamless technology in the background that would help them provide the care their patients deserve and desire. The vision also should consider how technology can drive efficiency and support care outcomes. For example, documentation tasks such as recording and transcribing patient information detract from time spent directly with patients. The burdens of manual documentation generally result in less frequent documentation, which leaves real-time vital sign data lacking and limits the use of clinical decision support tools, such as the Modified Early Warning System (MEWS), to monitor and respond to changes in patients’ conditions. Technology also can help reduce waste and manage throughput, which, in turn, helps care teams. Infrastructure. How connected, secure, and resilient is the health system’s infrastructure? Contextual/dynamic. Do information exchanges enable safety and optimal decisions? Conversational complexity. Is information exchange orchestrated to meet the organization’s needs? Terminology/semantic. Do the places that send and receive the organization’s data speak the same language? Syntactic. Is the information the health system needs to exchange formatted to meet those needs? It is important to make coordinated progress along each dimension to increase the degree of interoperability from basic to advanced levels. Current-state assessment also should include analyses of costs and contracts. Health systems and providers need to know the total cost of installing and maintaining the thousands of interfaces and systems supporting data exchange. They also would benefit from understanding how contracts for each device and IT system, including EHRs, affect their level of interoperability. Identify gaps. After the current state has been assessed, the team can identify gaps between the desired and current states. It will be important to clearly define gaps and measures to evaluate progress being made in filling those gaps. As needs will likely overwhelm available resources, it will be essential to prioritize and gain executive and organizational alignment around each remedial measure. Develop an implementation plan. Having identified interoperability gaps, the team can create a plan for addressing them. This plan should detail priorities and suggest a phased approach that emphasizes clinical impact and allows for measurable levels of attainment. The technical activities outlined in the road map could be framed through a clinical perspective. The clinical area may be divided according to five care contexts as shown in the exhibit below. Technical activities also should take into account the most appropriate sequence for integrating devices and systems. One consideration is balancing criticality of data with ease of integration. Vital signs, for example, are deemed vital for a reason, and it would make sense that vital sign data be readily available. The first phase of integration could focus on noninvasive vital signs (e.g., temperature, blood pressure, pulse, respiration rate, and oxygen saturation). The second phase could address critical care vital signs (e.g., monitors in the intensive care unit, operating room, or emergency department), and infusion pump, ventilator, and EKG data. A third phase could integrate bed alarm management, call bell management, defibrillation data, and anesthesia data. Another consideration is prevalence and extent of use of point-of-care devices. The exhibit below presents a sample tabulation of device occurrence across acute care domains. Such a survey can help an organization prioritize its interoperability improvement efforts. The key consideration when phasing improvements is making sure those improvements suit an organization’s needs, including what’s important to clinicians. Opportunities abound for interoperability to positively affect safe clinical outcomes and patient satisfaction while also reducing costs and improving operating efficiencies. Describing a path forward—both a starting point and a gradual evolution across the clinical and technical domains of the health system—is the foundation for an organized effort to drive progress. Achieve immediate wins. Early success will help the team gain support for the implementation plan. Under the infrastructure dimension of interoperability, there is potential for a quick win in improving the wireless environment, which in an increasingly mobility-centric world is an essential preliminary step toward connected, interoperable, and trusted health care. A reasonable starting point for evaluating wireless health is a Wi-Fi traffic assessment. Detailed findings can inform remediation recommendations to ensure a high level of wireless assurance. Maintain focus and communicate successes. Maintaining the enthusiasm and buy-in to execute long-term strategic initiatives is not easy. It is important to keep the established team engaged and celebrate milestones achieved. Communicating successes related to improved care, increased efficiency, and reduced waste will be important to sustaining momentum. Achieving interoperability requires effort on both the business and technical side of operations. One tactical step that health systems and providers can take immediately, and in parallel with enacting long-term strategies, is to audit existing contracts. Any contractual language that impedes optimal patient care should be catalogued. Examples of such language are gag clauses, provisions that inhibit data sharing or make it prohibitively expensive, and limitations on engaging other vendors and third parties. To remedy contractual terms that are counter to the best interests of patients, these terms must first be identified and understood. We can no longer accept the status quo of U.S. health care. We must require the same level of interoperability that we enjoy in other aspects of life. It’s time for the healthcare ecosystem to come together and drive change. Patients deserve better outcomes and care experiences, healthcare professionals deserve technology that helps them excel in their jobs, and our nation deserves a sustainable health system to care for generations to come. Ed Cantwell is executive director, Center for Medical Interoperability, Nashville, Tenn.
Kerry McDermott, MPH, is vice president, public policy and communications, Center for Medical Interoperability, Washington, D.C. I had a routine doctor visit this week. This physician was not part of the Vanderbilt Medical Group, where my primary care physician practices. The first 20 minutes of my visit was filling out, by hand, a six page medical history. My daughter, Carrie, has been in Switzerland in school this year, and we can send her money by pressing a button, and talk to her by Skype from our cell phones or tablets. I will be going to the Middle East next month, and I will be able to answer emails and conduct business seamlessly across nine time zones. However, in healthcare, information gathering and transmission is maddeningly redundant and extraordinarily atomized. Hopefully, relief is in sight. As information technology has advanced, health professionals and systems have seen improvement, but they remain frustrated by the inability to integrate data from multiple sources, a veritable “built to fail” model when manufacturers create technology that will only communicate with other products made by the same manufacturer. Into this breach comes the Center for Medical Interoperability. The center’s seed funding came from the Gary and Mary West Foundation in Southern California, but it has quickly advanced to become the nation’s leading advocate of change. The center, founded by Dr. Michael Johns and led by Ed Cantwell, determined that to be the most effective, it needed to relocate to Nashville — the center of health care. 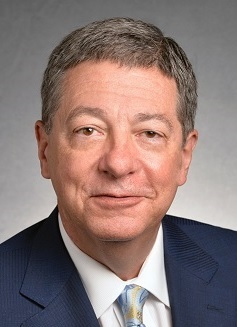 The center’s board includes a who’s who of Nashville CEOs, including Milton Johnson (HCA), Wayne Smith (CHS), Bill Carpenter (LifePoint), Jeff Balser (Vanderbilt) and Mike Schatzlein (St. Thomas), as well as the CEOs of such health care brands as Johns Hopkins, Northwestern and Cedars Sinai. The center is in the process of developing common communication standards for medical devices, with a multi-year plan that will bridge point-of-care information, health applications, enterprise technologies and, ultimately, national health information exchanges. The desire is for all patient data to be connected across the spectrum of care, whether home, ambulatory, acute or post-acute. The goal is for every health device to be able to “plug-and-play” off a single interoperable platform. Banking was once ATM and swipe cards, but now it’s chips and wireless. Similarly, the future of health information is wireless. In Nashville, the Center for Medical Interoperability is developing the national wireless lab to establish construction standards, architectural processes and best practices for wireless medical devices. Ultimately, the center will formulate wireless technology standards and certifications. The era of health information is at an inflection point. The bedrock of health decision making is current and accurate data. As the nation moves to the next level of clinical efficiency and effectiveness, expect Nashville to be the center of architecture, planning, and certification for medical interoperability. Richard Cowart is chairman of the health law and public policy departments at Baker Donelson. Reach him at dcowart@bakerdonelson.com. Medical interoperability is health care’s Achilles heel that, unless solved, will put the industry in a backseat position in figuring out solutions to a variety of tech problems, experts said. The health care industry needs to ramp up efforts to sync tech systems if it wants to have a voice in how its technology and data is harnessed, experts said at a Nashville Health Care Council event. Medical interoperability is health care’s Achilles heel that, unless solved, will put the industry in a backseat position while the government or Millennial innovators take the lead in figuring out solutions to a variety of tech problems, speakers at the panel said. Health care technology, be it machines or software, is largely disconnected. It’s not the plug-and-play tech that allows people to save files on a USB drive to open on any computer. 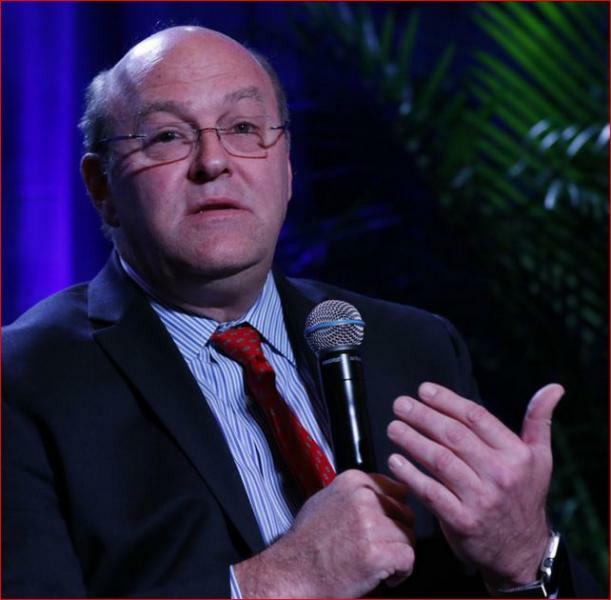 Interoperability, noted moderator Ed Cantwell, executive director of the Center for Medical Interoperability, carries different meanings for different people and companies. In short, it’s the ability to connect, sync and harness technology, and the data it generates, with seamless exchange. The industry doesn’t have it. Outfitting a facility with technology is expensive, which Schatzlein said is counter to initiatives to push down the cost of care. Modernizing and integrating the tech system is going to be necessary for precision medicine — when treatment is tailored to a person’s genetic makeup. Cantwell is leading the Center for Medical Interoperability, a new organization headquartered in Nashville, that is building a lab and bringing together leaders of industry heavyweights to find a solution. 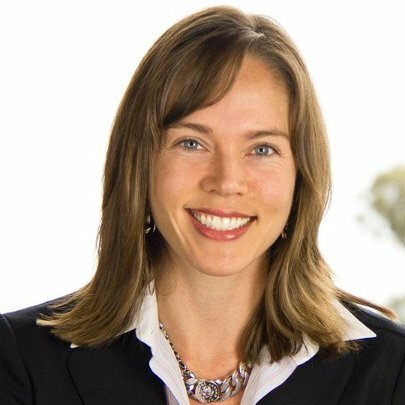 Schatzlein is on the board of the Center, along with HCA’s R. Milton Johnson, Vanderbilt University’s Dr. Jeffrey Ballser, LifePoint Health’s William Carpenter III and Community Health Systems’ Wayne Smith. The health care industry needs to come together to find an answer to the lack of interoperability between hardware and software systems before other entities mandate or come in with a solution. Zane Burke, president of Cerner, left, talked with Dr. Mike Schatzlein, senior vice president of Ascension Health, in a discussion moderated by Ed Cantwell, center, of the new Nashville-based Center for Medical Interoperability. Thinking about the future business model is challenging right now because success is dependent upon harnessing the data, said Burke. “He who has the data or she who has the data will win,” said Burke. Both Schatzlein and Burke agreed it would be best for the industry if it was able to solve connectivity issues on its own without the government take a leading role. Other industries — apps can be developed for smartphones that can plug into any computer — have figured out connectivity issues and the speakers said all parts of the health care industry should be working to solve this. “We would rather there be a private sector solution. … Whether you’re conservative or liberal you probably don’t want the government in this,” said Schatzlein, alluding to Big Brother concerns that could arise if the government is heavily involved in a solution. Burke wants the industry to find a way to assign a single patient ID to each person so care is more easily matched to the right person. Federal efforts have thus far failed, he said. A person’s medical record is strewn between many providers and facilities in different formats, ranging from paper to electronic files that don’t transfer. Burke said Cerner is passionate about easing the process of matching files and care to the person to improve treatment and outcomes as well as manage the information that will be necessary under a population health model. Today, a crowd of more than 300 Nashville Health Care Council member executives gathered to hear from national thought leaders on a topic that is top-of-mind for most players and pundits in health care: interoperability. 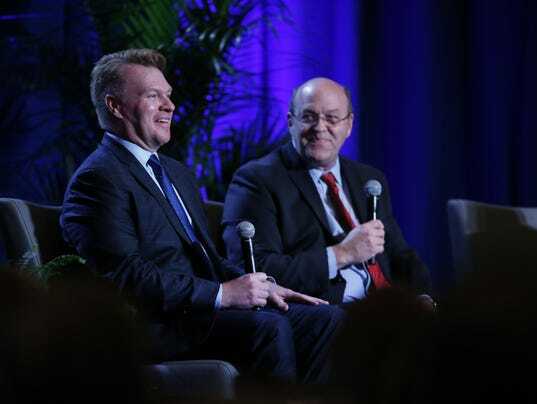 Zane Burke, president of Cerner, joined Mike Schatzlein, M.D., senior vice president and group ministry operating executive, Ascension Health, in a discussion moderated by Ed Cantwell, executive director, Center for Medical Interoperability. The term interoperability includes all the technology involved in patient care, from medical devices and tests to the electronic health records that hold a patient’s medical data and history. While there has been great investment in these technologies, few of these elements currently communicate with one another, causing inefficiencies. The trio discussed interoperability’s significance from the perspective of patients, providers and industry innovators, as well as key barriers to achieving interoperability. The Center for Medical Interoperability recently moved its headquarters to Nashville, Tenn., home to world leaders in the areas of hospital management, ambulatory and outpatient surgery, long-term care, behavioral health, population health, academic research, and health information technology. The Center has a goal to connect the nation’s network of devices and software by developing a “plug-and-play” system that shares data in a standard, nonproprietary way. The panelists agreed that the health care industry, rather than the government, should lead interoperability, and the Center is the right vehicle in which to develop the solution. Cantwell pointed out that medical interoperability could save the U.S. health care system as much as $30 billion a year by reducing mistakes and inefficiencies. The presenting sponsor for today’s program was BlueCross BlueShield of Tennessee. Supporting sponsors were Bass, Berry & Sims, Cressey & Company, KPMG and LifePoint Health. The Nashville Health Care Council is a premier association of health care industry leaders working together to further establish Nashville’s position as the nation’s health care industry capital. Supported by nearly 300 corporate members, the Council serves as a trusted source for information on trends that influence the health care industry. The organization provides members with one-of-a-kind networking opportunities and access to Nashville’s elite health care business community. Worldwide, Nashville’s health care industry generates more than 500,000 jobs and $73 billion in annual revenue. The industry is Nashville’s largest and fastest-growing employer. For more information on the Council, please visit www.healthcarecouncil.com. NASHVILLE—Cerner Corp. President Zane Burke said Friday that connectivity between clinicians remains an issue despite about $30 billion spent by the federal government over the past five years to improve electronic health records technology at hospitals and physician offices. 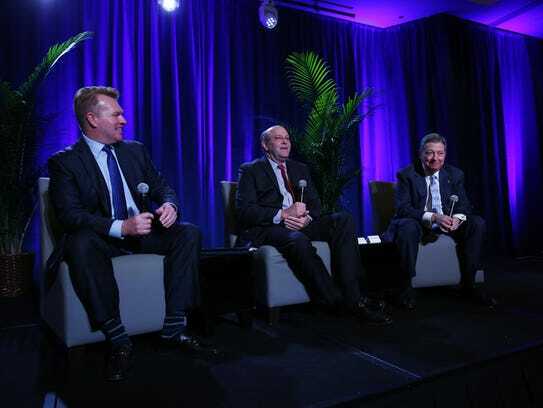 Speaking at a luncheon panel of the Nashville Health Care Council, Burke said healthcare costs are higher than they would be if clinicians had real-time access to patient tests and data across providers and offices. Ascension Health Senior VP Mike Schatzlein, who joined Burke for the event, said hospital executives and IT vendors will be coming to Nashville on April 14 to look for ways to standardize records infrastructure so medical devices and equipment can better communicate with one another. That meeting is being organized by the Center for Medical Interoperability to promote private-sector solutions to the problem that government can ultimately support rather than direct, Schatzlein said. Center CEO Ed Cantwell moderated today’s panel. Schatzlein, who oversees 40 hospitals for Ascension Health, said the government’s $30 billion electronic records initiative helped providers across the country improve their systems, but they still lack easy connectivity because they are built on disparate platforms developed by different vendors. “We still didn’t get a national medical record,” he said. Each panelist expressed doubt that the government would approve a national patient identifier program, which would allow records to follow the patient from provider to provider. The political and security obstacles are too significant, they agreed. Instead, standard platforms akin to the Apple iPhone and Android would allow vendors such as Cerner to compete on clinical applications rather than infrastructure, Cantwell said. The Center for Medical Interoperability, an industry group and lab designed to make health care technologies and tools work together in a way that improves care, will soon set up shop in its new OneCity headquarters. This week I chatted with Ed Cantwell, the center’s executive director, about the center’s mission. Tell me about the center’s background. How’d it come to be? It starts with Gary and Mary West. … They were self-made billionaires. … They, essentially, are giving back their fortune. [Gary] thinks the percentage we’re spending on health care is a threat to the nation, and certainly it’s a threat to the American dream. … A centralized lab is where an industry comes together. They drop their competitiveness, and they come together and form a nonprofit, for the good of the public, for the good of the industry. And they agree upon the underlying framework on which their industry exists. It’s not that people aren’t talking about the problem, it’s just that nobody’s doing anything about [it]. … Somebody’s going to step up and solve this problem, and when it happens it’s going to be truly transformational. The Center for Medical Interoperability board includes Milton Johnson, chairman and CEO of HCA Holdings Inc.; Wayne Smith, president and CEO of Community Health Systems Inc.; William Carpenter III, chairman and CEO of LifePoint Hospitals; Dr. Jeffrey Balser, vice chancellor for health affairs and dean of the Vanderbilt University School of Medicine; and Dr. Michael Schatzlein, former CEO of Saint Thomas Health and now senior vice president and group ministry operating executive for St. Louis-based parent company Ascension Health. The center will eventually employ 100 to 125 engineers to test if vendor products meet the criteria of interoperability as defined by the center. East Nashville-based Wagon Wheel Title is expanding, with the ownership entity targeting May to start work on a new structure to house the Five Points-area business. Currently, the business operates from 2,000 square feet from the building located at 202 S. 11th St. The new office will be housed at 204 S. 11th. “We’ve simply outgrown our current space,” said Brandon Miller, Wagon Wheel Title and Escrow LLC co-founder. “It’s taken us quite a while, but after searching for a larger office space (a three- to four-year process) we had the opportunity to acquire the parcel next to our current office, and so we did,” Miller said. “We’ve been in East Nashville/Five Points right at 10 years now, so we really didn’t want to move as we are rather invested in the area and community at this point. Building Ideas/David Baird Architect has designed the building (pictured) in which Wagon Wheel will move. Shaub Construction will be the general contractor for the project. Core drilling for soil samples has taken place on the SoBro site on which Fayetteville, West Virginia-based MountainShore Properties LLC is targeting what is believed to be a Hyatt House hotel building. TriState Drilling LLC handled the work, with a Post reporter having seen the work Monday. The multi-parcel site has addresses of 525, 527, 531 and 533 Fifth Ave. S. It was previously under contract to an entity that planned to develop a building to house offerings to an exclusive membership and to have been called Lyden. Lance Bloom, a broker with the local office of CBRE, is listing the property for Towery. Tarek El Gammal and JC Darby of Southeast Venture are representing MountainShore Properties. The morning daily notes the prospective developer is considering a Hyatt flag hotel for the site. oneC1TY developer Cambridge Holdings Inc. announced today that the Center for Medical Interoperability has finalized its lease and will move this fall from temporary space in Green Hills into a 16,000-square-foot headquarters office at 8 C1TY Boulevard. According to a release, the lease marks the completion of office space available at 8 C1TY Boulevard, the first of multiple buildings (office, residential, retail and hotel) planned for the health and technology focused mixed-use community on Charlotte Avenue near the 28th/31st Avenue Connector. The Center for Medical Interoperability is a national nonprofit organization serving member hospitals and health systems and dedicated to improving the way medical devices, health records and other information technology systems interact. The new office at oneC1TY will include a technology testing and certification lab with physical space, equipment and systems emulating the healthcare environment. Bill Bundy, the center’s vice president for member services and operations, said Nashville’s “culture of collaboration, leadership in health care innovation and commitment to our mission” are an ideal home for the center. Ryan Doyle serves as oneC1TY general manager, and is overseeing the development for Cambridge. The Fifth Avenue site on which work is underway for Olmsted SoBro is about to have a crane erected. Olmsted SoBro (to be located a half-block north of the site on which the hotel referenced above will sit if built) will be a six-story 328-unit apartment building (read more here). In contrast, the tower crane on the Thompson Nashville hotel construction site in The Gulch is being disassembled (see a photo by clicking on View Gallery within the above image). Walking around the future headquarters of the organization he’s been charged to build, Ed Cantwell shared his grand aspirations. Ideally, he said, the space on the second floor of OneCity’s first office building will become a hub for the way future health care innovations are developed. The goal is to house more than 100 engineers here, staffing a lab that helps health care technologies work together in a way that can transform the industry. He also hopes to share space with innovators and entrepreneurs who see ways to make a real difference in health care once the industry’s data is more accessible. Interoperability is one of those health care buzzwords that lots of people use without necessarily defining it the same way. For the purposes of the center, Cantwell said, it means effectively sharing data in a way that ensures health care technologies, products and tools meet five criteria: they must be plug-and-play (no cost to switching platforms), two-way (able to both send and receive), one-to-many (so the addition of a new device doesn’t throw off what’s already hooked up), standard space (aka not proprietary) and truly trusted (guaranteeing safety, privacy and security). In practice, he compared the idea to a state-of-the-art Ford F-150. There’s one big reason Nashville’s the best place to set up a center that can help the industry achieve that level of performance in health care, Cantwell said. Actually, there are five: HCA Holdings, Inc., Community Health Systems, LifePoint Health, Vanderbilt University Medical Center and Ascension Health (represented here by its local system, Saint Thomas Health). That list includes three of the country’s largest for-profit hospital systems, its largest nonprofit system and one of its most prestigious academic medical centers, and they’re all represented on the CMI board. The “procurement power” of those groups makes it more likely they can influence vendors to work with the center on achieving those criteria, Cantwell said. Cantwell compares the center to similar industry labs in other industries, particularly the cable industry’s operation in Colorado. That’s the model he shared with the philanthropists who helped get the center started, Gary and Mary West, who see this type of endeavor as key to improving health care quality while cutting its cost. “If you don’t solve this interoperability issue, then health care will never command the data that allows us to address the high cost, the poor patient safety, the precision medicine. 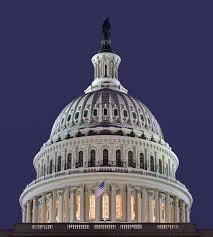 And you’ll never relieve the burden from the caregiver,” Cantwell said. 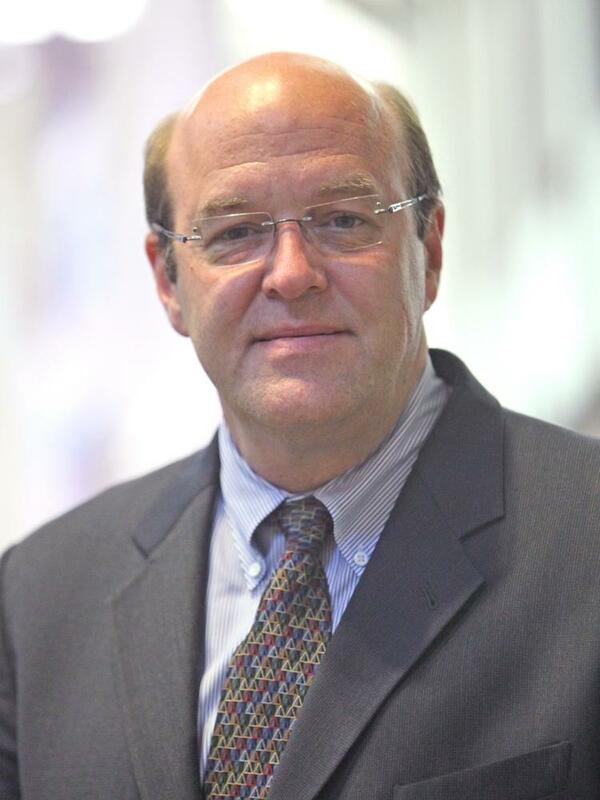 Ed Cantwell is executive director of the Center for Medical Interoperability.